Sleek, sophisticated and a joy to drive on long highways and narrow passes alike, the 6 Series is BMW's answer to what a grand touring car is all about. Those able to afford its $75,000-plus price tag will further bask in the 6 Series' cachet that garners a prime spot at the valet. Beyond their prodigious power, advanced technology and rich amenities, the 2014 BMW 6 Series is roomier yet less expensive and more fuel efficient (in turbo-6 form, at least) than grand touring cars such as the Jaguar XK and Mercedes-Benz SL-Class. Price is relative here, and at over $75,000, even a base 6 Series is a reach for most buyers. For those seeking lightning-fast luxury on a (slightly) tighter budget, an Audi S5 coupe or convertible has more horsepower, is quicker to 60 mph, and costs considerably $25,000 less. Drivers who love engaging their left foot will rejoice that M6 performance variants can be had with a 6-speed manual transmission in lieu of the 7-speed double-clutch automatic. For just 100 buyers, there is a limited Frozen Brilliant White Edition convertible. All 2014 BMW 6 Series models receive updates to their navigation systems. While we appreciate BMW's luxurious interiors, but we'd still rather ride in an Audi cabin. That said, new hues, more premium materials and interesting shapes are finding their way into new BMWs, and the latest-generation 6 Series may be one of the best examples yet. The leather-wrapped driver and passenger seats coddle bodies, and if their 10-way adjustment isn't enough, you can double that amount as an option. The two rear seats in the coupe and convertible are tight for adults, but the trunk is surprisingly sizable. Convertible 6 Series models have a black fabric top that doesn't eat up much cargo space when folded. The 2014 BMW 6 Series has an athletic profile defined by a long hood and a striking crease that's nearly the length of the body. We appreciate the Coupe's confident, not cocky, nature. The 6 Series Convertible, likewise, is an elegant tourer with the top down, but to our eyes doesn't quite have the visual balance of the Coupe. This is even more apparent when the black fabric top is raised. M6 performance models are distinguished by wider 19-inch wheels, quad tailpipes and carbon-fiber composite roof panel. The 2014 BMW 6 Series boasts something of a Jekyll and Hyde nature, but both characters in this story deserve praise. Think of Comfort mode as Dr. Jekyll, in which the BMW 6 Series is a high-power pleasure cruiser with a comfortable-yet-responsive ride. Switch the Driving Dynamics Control to Sport+ mode, and suddenly Mr. Hyde appears. Here, the transmission eagerly kicks down, the revs go up, the suspension tightens, and the 6 Series begins to feel like a smaller, lighter sports car. It's safe to say that no 6 Series is slow. With a "base" 640i Coupe, you'll beat a most other cars up the onramp with a 0-60 mph time of 5.3 seconds. Step up to the fire-breathing M6 and suddenly you're hitting that mark in just over 4 seconds. But even here, switch settings and your speed demon returns to a more docile form. The 2014 BMW 6 Series Coupe has a Manufacturer's Suggested Retail Price (MSRP) starting at over $75,000. 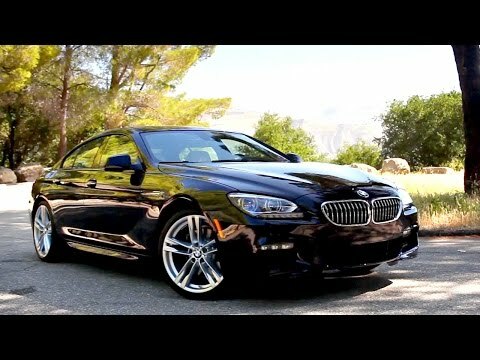 V8-powered 650i Coupes start at over $87,000, and top-line M6 models start at over $111,000. Add a convertible top and/or options, and these prices swell by thousands of dollars. Pricing for the luscious-looking 4-door Gran Coupe begins at around $80,000. At its base price, the 2014 6 Series is above 2+2 luxury cars such as the Audi S5 and Mercedes E-Class and C63 AMG coupes. It is below the starting price of a Jaguar XK, the Mercedes-Benz SL-Class roadster and the larger CL-Class coupe. Before buying, be sure to check the Fair Purchase Price to see what others in your area are paying for the BMW 6 Series. Long-term resale value is expected to be better than that of the Jaguar XK, near that of the Mercedes-Benz E-Class coupe, and lower than that of the Audi S5 and Mercedes-Benz C63 AMG. Even a base V6-powered 640i Coupe is highly equipped with a leather and wood interior, xenon headlights, navigation system with 10.2-inch display, dynamic cruise control and rearview camera. The standard audio is a 9-speaker/205-watt system. Along with a V8 engine, 650i models up the ante with Nappa leather, 20-way power front seats, 19-inch wheels, and a 12-speaker/500-watt audio system. Scheduled maintenance for 4 years or 50,000 miles is included as part of BMW Ultimate Service. Models listed as xDrive come with all-wheel drive instead of a rear-drive configuration. Aside from some a la carte options such as 20-inch wheels and ceramic controls for the iDrive command-center module, most options for the 2014 BMW 6 Series are bundled into packages. Among the more tantalizing ones are the Executive Package with amenities such as ventilated front seats, soft-close doors, and a futuristic head-up display that projects travel information onto the windshield so you can focus on the road. For audio appreciators there's the Bang & Olufsen sound system, and the performance-minded may steer toward options like active steering (with rear-wheel steering) and Adaptive Drive. A night-vision system can detect pedestrians via infrared camera. The name may sound odd to those who aren't audiophiles, but listen to this optional sound system and you'll soon join their ranks. This primo audio option drenches ears with 1,200 watts of sound emanating from 16 speakers, each with its own amplifier. Using cameras in the outside mirrors, this optional system provides a bird's-eye-view of the area around the car to aid maneuvering in tight spaces, while its selectable Side View function uses cameras in the sides of the front bumper to monitor traffic crossing in front of the vehicle. The 2014 6 Series is motivated by 6-cylinder or 8-cylinder engines and is offered in a trio of performance flavors. The 640i models use BMW's much-loved 3.0-liter turbocharged inline-6 that makes a robust 315 horsepower. Moving up to the 650i nets a 4.4-liter turbo V8 good for 445 horsepower. At the top is the M6, which also uses a 4.4-liter turbo-8, but one tuned to make a sizzling 560 horsepower. The first two are connected to an 8-speed automatic transmission and are all-wheel drive (AWD) or rear-wheel drive (RWD). M6 variants use a 7-speed automatic or 6-speed manual and are rear-drive only. In an effort to use less of its required premium gasoline, the 2014 BMW 6 Series features auto start-stop functionality that can cut engine power at idle. Slotted between BMW's 5 and 7 Series sedans is the 6 Series line of coupes and convertibles. While its numerically lower and higher kin constitute practical transportation for the well-heeled, the more exclusive 6 Series models are for buyers more interested in style and image. They offer heaping portions of both, and a hearty helping of BMW's stellar driving dynamics, especially in the high-powered M variants. With roots tracing to the late 1970s, today's 3rd-generation 6 Series has raised the ante for grand-tourers. The 6 Series models' power and looks enable them to stand up to the Jaguar XK, Mercedes E-Class Coupe and Audi S5 in this niche segment, while buyers desiring more space can have it in the 4-door, 5-passenger Gran Coupe variant. The highlights are the speed and the body. It is also very dependable. It performs extremely well, but at times it may be a gas guzzler. It is very fast and dependable but you will pay a lot to keep up with the maintenance. I drive it roughly 20 hours a week and it does amazing for me. I would recommend this vehicle to anyone looking to purchase a car. The car is very distinctive, its features are fast and its design is more than wonderful, and its disadvantages are that lighting sometimes disappears and is very much idle, and in terms of comfort it is very convenient and affordable. It is a very nice luxury car and has good qualities, the one drawback is that it doesn't have a lot of room. When I first bought the car it was slightly used, but I had a major issue with the keys not working. SInce then there's only been very minor issues and it rides nicely.